How Do I Access ANALOG BRASS AND WINDS in Komplete Kontrol/Maschine? You can now directly browse through our Kontakt-based Instruments in Maschine and Komplete Kontrol's browser. 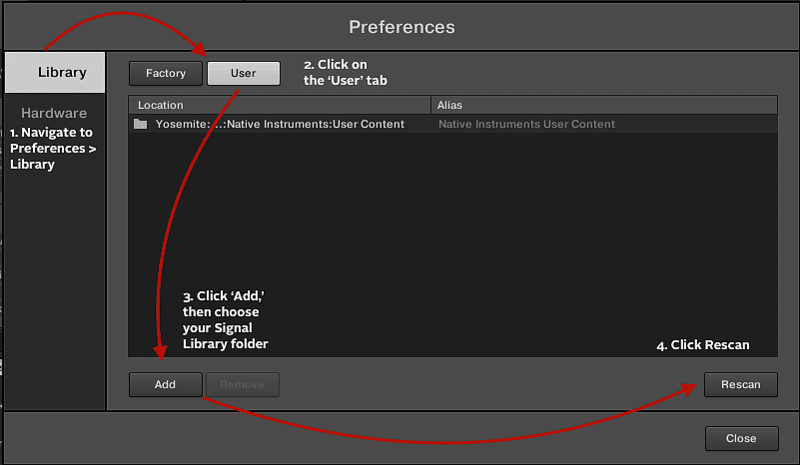 You can also access all of SIGNAL’s parameters in the Maschine / Komplete Kontrol menu pages. Here's how it's done, using SIGNAL as an example. Click Rescan. Now SIGNAL’s Pulse Instruments will show up in the Maschine / Komplete Kontrol browser. SIGNAL will now populate in the 'User' tab of Maschine and Komplete Kontrol's browser. 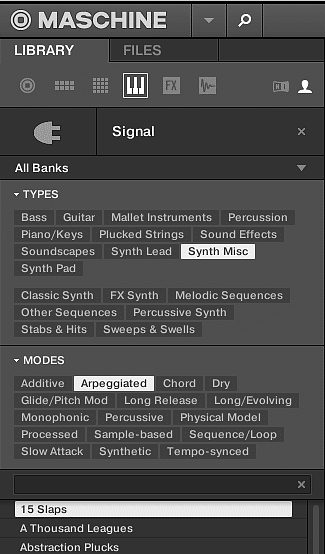 Each of one of SIGNAL's Pulse Instruments are tagged according to Native Instruments' tagging convention, and you can feel free to add your own tags by clicking the 'Edit' button in the bottom of the browser. Notice that Native Instruments uses a tagging scheme that's a bit different from SIGNAL's internal tagging grid. Tags assigned to a patch in Maschine / Komplete Kontrol will not update in SIGNAL's internal tag grid (and vise versa). In other words, when you save a preset with the 'Low' tag in SIGNAL's tag grid, you will not find the preset tagged as 'Low' in Maschine or Komplete Kontrol's browser. It's important to understand that when you save a preset in SIGNAL, you create a .NKA preset file that's stored in your Signal library folder. In order for your new preset to be accessed via the Maschine / Komplete Kontrol browser, you need to save this preset as a Snapshot. Do I Have to Purchase Kontakt to Use ANALOG BRASS AND WINDS?